Competitive benefits = better recruitment and retention. Employees stay, recruits sign. Competitive benefits plans are one reason why small businesses that work with a PEO have a lower turnover rate — by 10-14%! 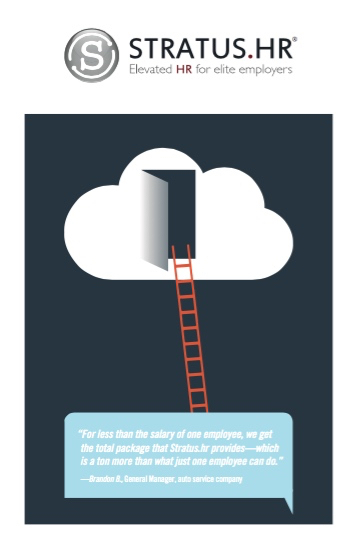 Outsourcing essential services to a local PEO like Stratus.hr means you’re always getting exactly what your team needs, regardless of the size of your team. No waste. No shortage. With growth comes liability. When Stratus.hr is your PEO, you have a team of HR experts who stay on top of regulation changes — both local and national — and ensure you’re always in compliance. A 2016 study by the National Association of Professional Employer Organizations (NAPEO) found that businesses working with a PEO like Stratus.hr grow 7-9% FASTER than other businesses. Time to work on your business, not HR. You have a business to grow. As your PEO, Stratus.hr handles payroll, benefits, risk management and more, so you can get back to work. Everything is covered. How will Stratus.hr help your business? Fill out the form and we’ll get you more details ASAP! Studies have repeatedly linked PEOs to faster, stronger growth for small businesses. Get more details here or request a FREE quote today!